When fans of good craft beer think about great places for the beverage of their choice, a few international hotspots come to mind. Germany. Belgium. The great city of Bend. However, as states such as Texas have shown, not even the most conservative state legislator can resist the siren call of alcohol tax revenue. In 2016, the state passed laws that allowed breweries to sell beer directly to consumers at their taprooms, and the 3.2 percent restriction on retail sale will be gradually phased out in 2018. And much of this revitalization is thanks to Tulsa-based Prairie Artisan Ales, founded by Chase and Colin Healey in 2012 with $20,000 of Kickstarter money. Now Prairie beer is beginning to be seen in Central Oregon tapwalls more often, and with the weather how it is, there's no better time to bask fully in one of their flagships. 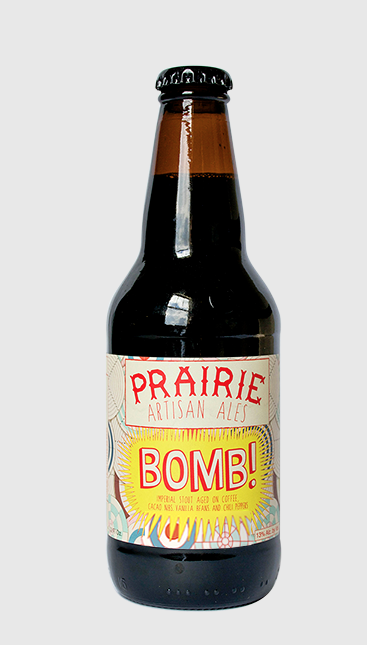 Prairie Bomb!, clocking in at around 13 percent, is an imperial stout aged on coffee, cacao nibs, vanilla beans and ancho chili peppers. It's made it into RateBeer's list of the world's top 100 beers for three years running, and despite that monumental ABV, it doesn't taste particularly boozy at all. The peppers provide just enough heat to mask it, complementing the coffee/chocolate one-two punch in a delightfully warming way. Those who get addicted to Bomb! during its current run on Bend taps will also want to keep an eye out for the many variants Prairie releases through the years. Birthday Bomb! adds caramel sauce to the mix for a dessert-y finish, Christmas Bomb! throws in a blend of wintry spices for more of a latte style finish, and Pe-Kan (sadly, OK-only) uses toasted pecans, rivalled only by hazelnuts in the realm of great dark-ale ingredients.